Outside the Box Food Truck and Catering Company. SFL. Fresh Turkey Breast, homemade pesto, vine ripe tomatoes, red onions, marinated artichokes and provolone cheese served on ciabatta bread hot off our press. 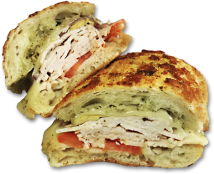 Fresh Chicken, homemade basil pesto, roasted red peppers, red onions and mozzarella cheese on ciabatta bread hot off our press. 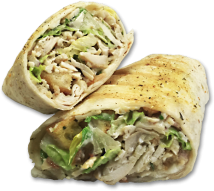 Fresh Chicken Breast, romaine lettuce, parmesan cheese, bacon and croutons in our homemade Caesar dressing on a plain wrap. 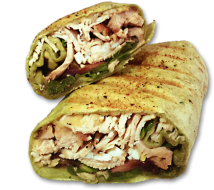 Fresh Chicken Breast, hummus, spinach, avocado, cherry peppers, chopped hard-boiled eggs and portabella mushrooms in a whole wheat wrap.